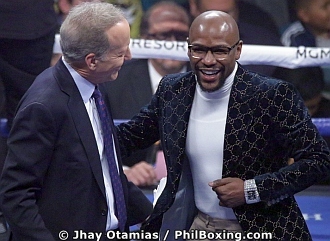 LAS VEGAS -- Money man Floyd Mayweather Jr dropped by backstage to greet Manny Pacquiao before strolling to the ringside at the MGM Garden Arena here as the Badou Jack vs Marcus Browne bout, the last fight on the Pacquiao-Broner undercard, got underway. Mayweather, who is retired, has been rumored to announce his rematch against Manny Pacquiao if the Filipino boxing legend wins tonight against Broner. Photos by Jhay Otamias / PhilBoxing.com. 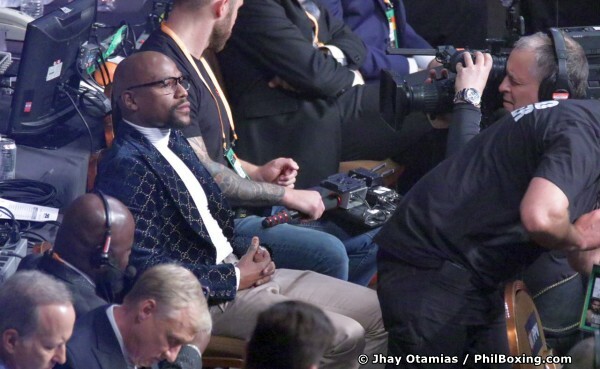 Floyd Mayweather Jr takes his seat at the VIP section of the MGM Grand Garden Arena Saturday night ahead of the Manny Pacquiao vs Andrien Broner WBA world welterweight championship fight.